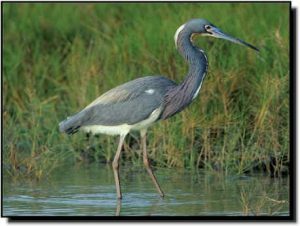 Comments: Previously called Louisiana Herons, Tricolored Herons are usually found in coastal areas using mangrove swamps, tidal creeks, shallow saltwater habitats and mudflats. Within the Great Plains, they have occasionally been reported breeding as far north as the Dakotas. Like other herons and egrets, they nest in mixed species colonies. Tricolored Herons are similar in size to Little Blue Herons and are most similar in appearance to Great Blue Herons. They have a white belly and neck, dark blue upperparts and reddish plumes on the backand upper wings during breeding. Immatures may have a rusty or rufous colored head and neck.